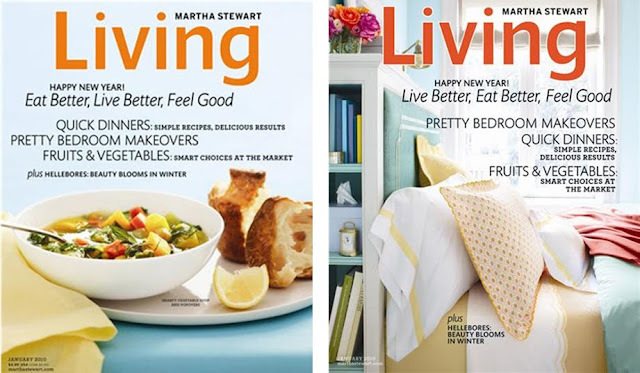 As 2010 nears its departure, I find myself with 12 more issues of Martha Stewart Living to savour and store for posterity. 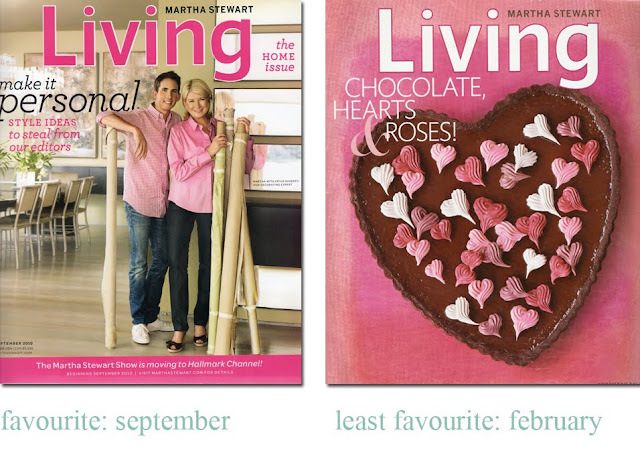 I also find myself writing my fourth-annual "Year In Review" column, summing up the year that was at Martha Stewart Living magazine and choosing my favourite and least-favourite issues, which is always tough to do. 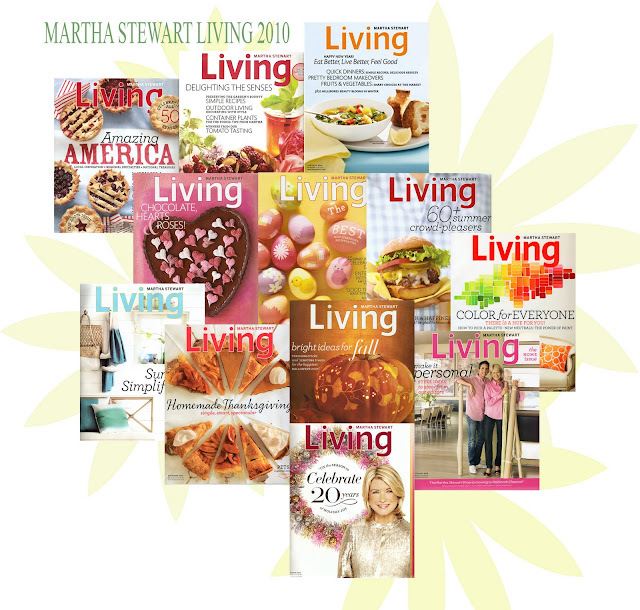 This year was a year of transition at Martha Stewart Living. Gael Towey, who was the acting editor-in-chief in lieu of Michael Boodro's leaving, passed on the torch to Vanessa Holden, who had been working at Martha Stewart Weddings. Beginning with the May issue, Vanessa signaled her arrival in a bright and colourful way, indicative perhaps of her exuberant personality and Australian roots! First, let's look at some of the changes and trends that we saw this year at the magazine. "WHEN YOU'RE THROUGH CHANGING, YOU'RE THROUGH"
That is one of Martha Stewart's favourite quotes, as I'm sure many of you know. We first heard it in her book "The Martha Rules" as advice to entrepreneurs about always staying fresh, open to the idea of evolving in business and keeping in step with the times. 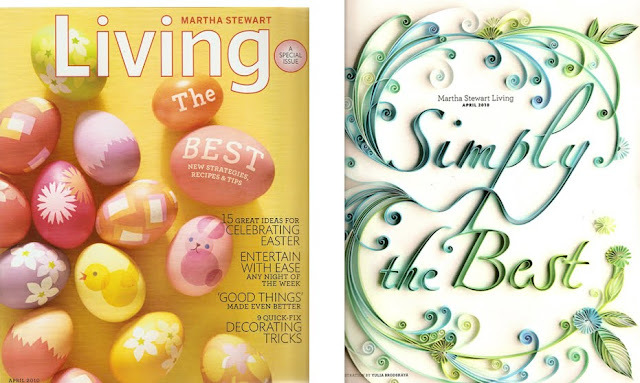 I think Martha Stewart Living magazine definitely adhered to that mantra this year, demonstrating a desire to stay modern and commercial without sacrificing its homage to the handmade, hand-crafted and traditional. The May issue brought the first unfurling of change this year. 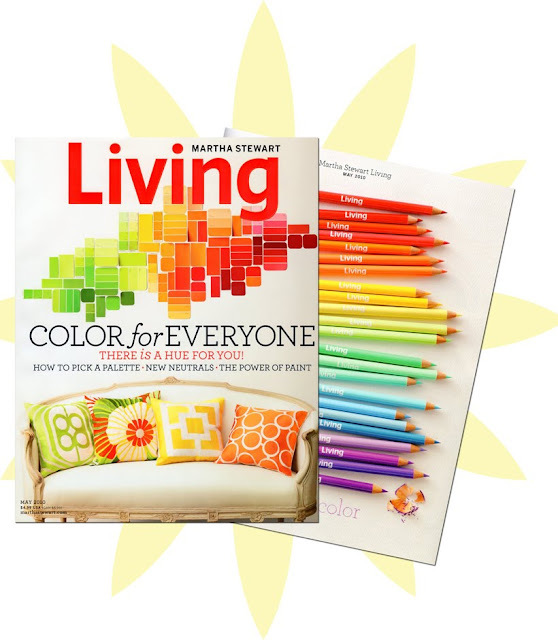 Vanessa Holden ushered in her fresh take on "Living" with a bright and sunny issue that felt utterly modern and vibrant. At the beginning of the magazine, "The Briefing" was changed to a less-abstract section called simply "Great Finds." In it, editors choose their favourite things for the home, for entertaining, for gardening and for wearing. Other changes I noticed this year were more subtle but had a powerful impact on the magazine's personality. For instance, the bold and unflinching use of colour in every issue was highly effective and captivating. This was, no doubt, an art-direction decision that definitely paid off with spectacular results. Take one look at the April issue, the May issue or the December issue and you'll see what I mean. The push for colour makes itself felt not only in the interior-decorating features but also in the food features, in the craft features, in the garden features and even in the wardrobe choices. I know colour is always a consideration in magazine design, but the results this year were especially powerful, I felt. The September issue brought with it new design changes, icluding new fonts, new layout and new promotional strategies. Among the changes were little 'buttons' featured throughout the issue that denoted a special selection. One such button was called "Martha's Pick" (something she considered to be her favourite) and others would feature an icon, such as a printer, to indicate that it was available on the website to download and print, such as the remarkable array of clip-art and templates the magazine offered this year. Two covers for January, sold separately on newsstands. (Subscribers received the one on the left.) The April issue had three covers, all contained in the same issue. (These were not sold as separate issues.) The August issue had two covers. The cover on the right was available only in certain parts of the United States, making it rare and collectible. Two covers for October, too! The one on the right was the newsstand issue, the one on the left was sent to subscribers. 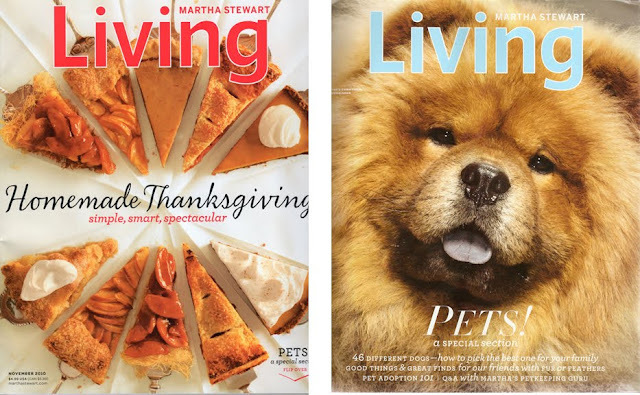 For November, the editors did a double cover; the cover featuring Martha's Chow-Chow Ghengis Khan was published on the back of the magazine, upside down. It introduced a special 26-page section on pets. The Halloween Handbook was a thick 'bookazine' that featured the best Halloween ideas the magazine has ever published. 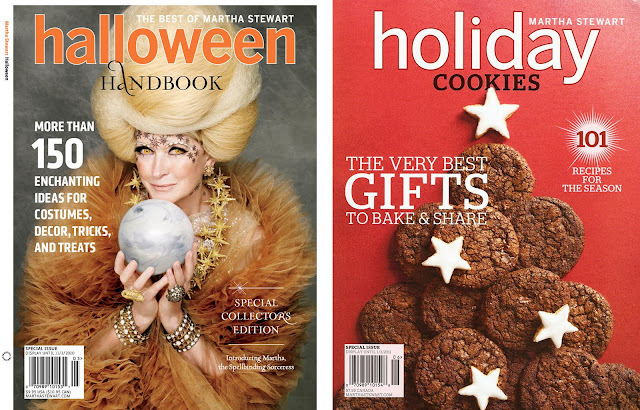 The Holiday cookie issue is another treasure to add your collection. Also of note was the special "Best Of" issue, which was the April issue. In it, the editors selected what they consider to be the best of everything: the best Good Things, the best tastemakers in the United States, the best garden tools, the best party tricks, the best kitchen tools, etc. It made the April issue a very special one indeed. Was it 'the best' issue of the year? Wait and see! I really do find this part hard. I love getting every single issue in the mail and I will be a subscriber for life, so I cannot begrudge a single issue that comes my way. BUT, I have favourites and as a longtime reader, I have definite opinions about what I like and what I think could potentially be improved upon. My favourite issue of the year was the September issue. My least favourite issue of the year was the February issue. For me, the September issue is always a highlight, year after year. 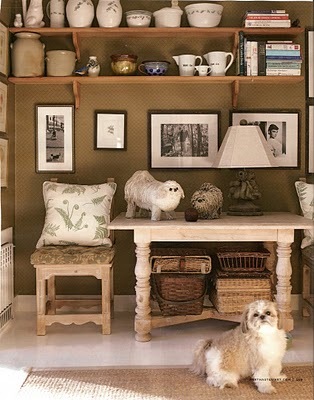 It is the special decorating issue and the focus on home is something that is always close to my own set of interests. Having said that, there are definitely some September issues that are better than others. What I loved about the 2010 September issue - and what set it apart from all the other issues this year - was its unexpected celebratory nature. Sure, the July issue was filled with patriotic fun and hoopla and the December issue was more than festive, but September is not generally a time to party. 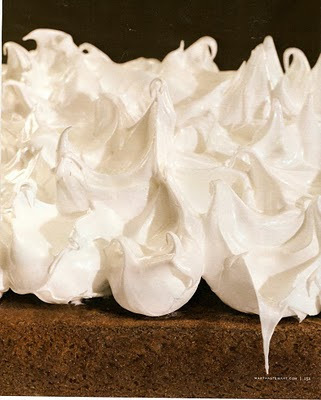 I thought it was so fresh and fabulous to include features on a house-warming party (at Kevin Sharkey's new Manhattan apartment) as well as an amazing, mouth-watering story on icing. The house-warming story was a brilliant way to literally celebrate all things 'home.' The icing story served its purpose ironically and metaphorically: it was truly the icing on the cake for this issue! Another component that is a 'must' for me each September is a feature on one of Martha's houses. I know I'm not alone here. 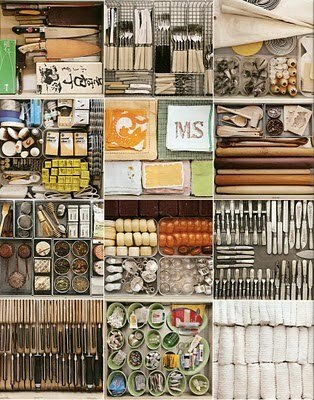 The story in this issue was a look inside Martha's kitchen cupboards and drawers with space-saving and organizing strategies for all of us to learn from, some of them quite quirky and fun. It was a great treat! 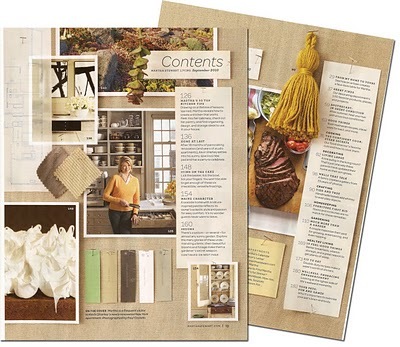 For me, the best issues are the ones that link traditional Martha Stewart Living staples with fresh design and new approaches. I liked the familiar faces (Martha and Kevin) on the cover but I loved that what we saw inside was new and unexpected. I liked that we saw so many enhancing design changes in the layout and headings in this issue, but that the content was still timeless and classic. That's why the September issue gets my vote as my favourite this year! I was so dazzled by the layout of the contents pages for this issue that I actually purchased a second copy of the magazine just so I could cut them out for my clippings binder. Peeking inside Martha's kitchen drawers felt sneaky, but it was all with her permission. I was glad to have an insider's look! 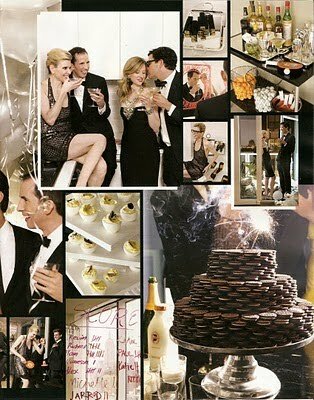 Kevin's house-warming party was beautifully photographed and whimsically editorialized in this issue. Celebrating home is one of my favourite things! To contrast the modern feel of Kevin's apartment the editors were brilliant to include something for everyone: a rustic, charming old house in Seal Harbor, Maine, provides a classic alternative and some new twists on country decorating. And the icing story. I just wanted to jump into the pages and go for a sticky swim! As for the February issue, well, I suppose the word I would use to best describe it is 'predictable.' It is a gorgeous issue, filled with wonderful photography and delicious recipes. But we've seen the heart-shaped confectionaries, we've seen pink and red, we've seen chocolate and roses. I know that's what Valentine's Day is all about, and I know that it's the third-highest-grossing holiday in North America after Christmas and Halloween, and I know the editors would be foolish to ignore those very obvious trappings, but after years of hearts, chocolates and roses, I would love to see something new for February. My favourite February issue was 1999 with Martha on the cover seated in a chair surrounded by her Himalayan cats. The whole issue seemed to be about 'warmth' not so much 'Valentine's' and the looser, freer theme gave it longevity and breadth. There was another feature that I distinctly recall from another February issue about 'perfect pairings' that was just sheer genius: bacon and eggs, salt and pepper, etc. There was another issue that had a piece about ice fishing. I'd love to see the February issue stretch beyond the typical with a great travel piece, or a feature on a house built for a true love, or a collection of skates, or a great party at a ski lodge. Chocolates, roses and hearts are nice, but we know that already. Sorry, February. In 2010 I liked you the least. 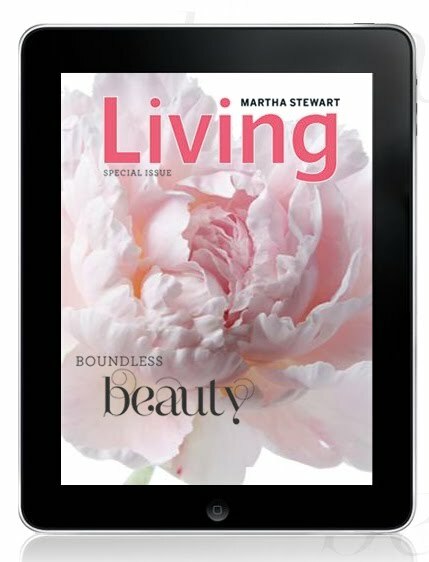 A huge deal this year was the release of Martha Stewart Living for the i-Pad, a digital issue with fresh, new content exclusively available as an i-Pad application. For $3.99 an issue, users could download new content and view spectacular photographs and read new features that were unavailable anywhere else. 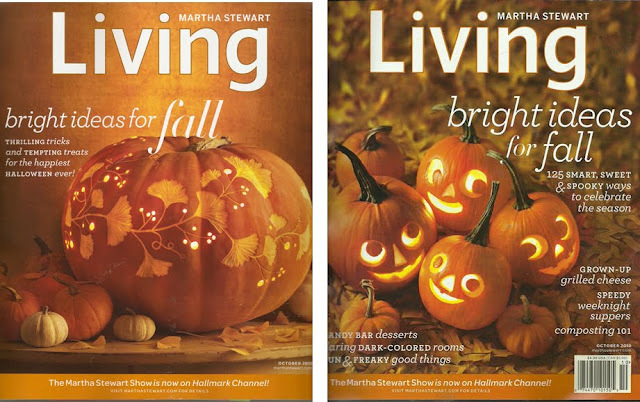 It was definitely a milestone for Martha Stewart Living! 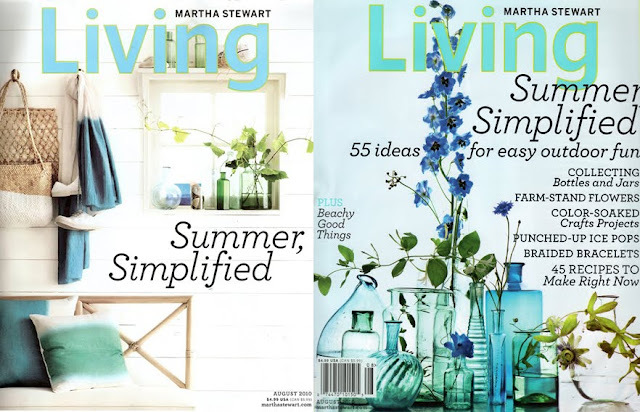 It had been announced earlier this year that Martha Stewart Living would publish a special UK edition this year, with its first issue arriving in September. Sadly, the publisher (Pizzazz Media) filed for bankruptcy just prior to the magazine's launch and the issue never saw the light of day. Hopefully the editors are working on finding a new publishing house in the UK to launch the UK edition. A very nice 2010 review, Andrew! I could have predicted that February would have been your least favorite issue! As a side note, the December 2010 issue also had an alternate cover of sorts.. the very front cover with Martha and the glam wreath.. There is the cover you featured in your post and another that says, "Tis the season to celebrate" Crowd-pleasing meals, personalized ifts for everyone, and one-of-a-kind decorations" It had no mention of the '20 years'. I can scan and send it to you if you'd like it for your archives. I have to agree with your favorite issue.. I just didn't care for the cover. The "matchy, matchy" outfits with Kevin and Martha were just a bit much for me to stomach. The content was fabulous though! So, here we are at the beginning of the 21st year of publication for this great magazine! I love having the entire collection since the first issue. They are treasures I look at time and time again. I love your 2010 review. I did buy the digital issue for my IPad. What a great issue. I can't wait to see what she will be releasing for the IPad in the future. I am also a subscriber since 1 year. The other issues I find them in thrift stores and I do collect them. What month and what year was the first issue? Helene, the first issue was published in November 1990, 20 years ago! I want to wish you Happy Holidays and a great 2011! I didn't enjoy the March issue or the October issue. They, to me, were a bit boring and I haven't looked back on them whereas I always look at the other months. I can't wait for 2011 to begin and to see what the editors have in store. And hopefully the UK edition will appear and I can send it to you and Kenn for critique! Thank you Andrew for your wonderful review. Hi Andrew! I've been reading your blog for a while now, and I've come to look forward to your "year in review" post. I completely agree with your best and worst pics, and I think this was an especially good year for Living. I am loving what Vanessa Holden is doing. It feel so light and colorful and beautiful and fresh. I agree with a previous commenter about it appealing to a younger audience. I'm 24, and have been a subscriber since I was 15. I was so sad to see Blueprint go without being given much of a chance, but some of the more recent Living issues seem to have some of the same bold, clean, and modern feel. Thanks for another great post, and happy holidays!